Perforating and scoring is a way to create creases in your documents that allow for easy folding and processing. 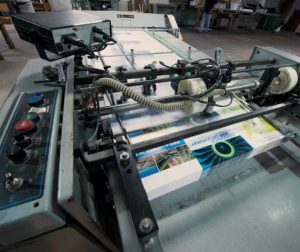 Perforations and scoring must be precise due to today’s new printing processes and specialty papers, and they are extremely important to professional finished products. Perforating prevents ruining a form, ticket or other materials from an incorrect tear. Once torn, there is a nice straight edge instead of a ragged one. Scoring is similar to creasing and it is valuable when making professionally finished brochures and booklets. Proper folding, without cracking, requires a nice, crisp score to create a hinge for the paper to fold along. Scoring is generally used when heavier stock needs to be folded. At Steve’s Bindery Service, Inc., we offer customers the option of putting round corners on almost any printed material. This enhances the look of the finished product. This also helps prevent the edges from fraying or becoming dog-eared. During the round cornering process, a semi-circle cut is removed from the corners of printed material. At Steve’s Bindery Service, Inc., we use the Rollem T-20 for perforating and scoring. It delivers flat, nearly invisible perforations. The adjustable crease depth allows us to create perforations and scoring specific to the type and weight of the paper. In addition, this machine allows us to achieve a sharper crease without cracking, even on difficult stock. The plant at Steve’s Bindery Service, Inc. is kept clean and organized – even when production is high and we’re quite busy. We stop and clean after every job. Our machinery is maintained diligently to keep it in the best possible working order. This means less downtime and more consistent production. When Steve gives a customer the date and time his or her job will be completed, it is done on this date or before. Steve delivers on his promises! Need more information or a quote?